This post is sponsored by Florida Prepaid College Plans. Use Florida Prepaid College Plans promo code SWEET19 to save on your application fee. All thoughts and opinions are my own. Please see my disclosure policy. Florida Prepaid Open Enrollment is ending soon! April 30 is less than 2 weeks away, and I don’t want you to miss out on the opportunity to give your children the lasting legacy of an education thanks to help from a Florida Prepaid College Plan! You can use Florida Prepaid College Plans promo code SWEET19 to save $30 off your enrollment fee! For my husband and I, there are many things that we want to pass along to our children. One of the greatest privileges and responsibilities for us to pass on to them is education. We feel that with a great education, you can certainly do anything that you put your mind to! Invest in the gift of education with a Florida Prepaid College Plan and let your children be the leaders of tomorrow! Are you still uncertain about whether or not Florida Prepaid is right for your family? Is your head spinning and you are in information overload with questions? Do you feel that it is too expensive? Which plan is the best one for my child? I am here to answer your questions! Trust me, I totally understand how you feel…overwhelmed, nervous, anxious, stressed. I felt those same exact feelings before we signed up Brady during this enrollment period! My husband and I did a lot of research, number crunching and planning before making this BIG decision. Should We Invest in a Florida Prepaid College Plan? I am here to encourage you and to tell you that Florida Prepaid College Plans is the best investment that your family can make! It is a worry-free investment that you will feel good about. As a parent, it is important for me that my children are able to pursue their goals and to dream BIG. When it comes to college and their future careers, I want to give them the BEST education possible. Thanks to a plan from Florida Prepaid, I can help to make those dreams a reality! Florida Prepaid College Plans are guaranteed by the State of Florida. When you sign up today as a new plan holder, your child’s future college education cost will be LOCKED IN at a low rate. You will never lose your investment! That is why it is SO important to sign up during Open Enrollment! There is a reason that over one million people and counting have purchased Florida Prepaid Plans since 1988! I am so glad to be one of those families! Are Florida Prepaid College Plans Affordable? As someone who lives a frugal lifestyle and tries to budget and plan my money, I appreciate that Florida Prepaid College Plans is very affordable. You really CANNOT afford to save for your child’s education! You can prepay for your child’s future college either through a monthly or lump-sum payment. And, you can even invite friends and family members to contribute along the way! I think it would be a wonderful idea to have family members to contribute for birthdays and holidays! Which Florida Prepaid Plan is Best for my Family? You will first want to look at your family’s budget to see how much that you can spend each month towards your children’s education. I would also highly suggest that you use the Florida Prepaid Pricing Tool. This tool is a fantastic resource that will help you calculate exactly how much your monthly payments will be for each plan. You simply enter the child’s date of birth and it will give you the monthly cost for each plan! 1-Year Florida University Plan – if you are looking to start small, this is the plan for you! This is the plan that we enrolled Brady with and I could not be more excited! It is such a flexible option and allows for different family members to purchase an additional year if they want to, adding up to 4 years! We are paying just over $60 a month for 30 credit hours, which is very affordable! 4-Year Florida University Plan– this is the most popular plan and offers the widest variety of bachelor’s degree options from one of Florida’s 12 State Universities with 120 credit hours. 2+2 Florida Plan– this plan covers 60 credit hours at a Florida State University and 60 credit hours at a Florida State College. You get the best of both worlds with this plan! 4-Year College Plan– this convenient and affordable plan covers 120 credit hours at any Florida State College. 2-Year Florida College Plan– this plan is an affordable way for your child to earn an AA degree from a Florida State College and guarantees admission to a Florida State University. Covers 60 credit hours. 1–Year Dormitory Plan– Florida Prepaid also offers a dormitory plan, which is a great option to add on to your Prepaid Plan! You may add dormitory housing coverage to a Florida Prepaid Plan with university tuition coverage at the time you enroll, or during a later enrollment period. A maximum of two semesters of dormitory fees may be prepaid for each year of State University coverage. Can a Florida Prepaid College Plan be used at a Private College or University? With your Florida Prepaid Plan, the value you pay to the other schools is the same you would have paid to a Florida school. While Florida Prepaid Plans are designed to be used at a Florida College or State University, the plans can also be applied at other schools nationwide. If your child attends an out-of-state college or private college, the plan will pay the same amount as it would pay at a public college or university in Florida. You would just be responsible if there is a difference. You can use scholarships in conjunction with a Florida Prepaid Plan. In fact, I think that it is important to encourage your children to apply for as many scholarships as possible. Having a scholarship in conjunction with a Florida Prepaid Plan will cover even more college expenses. If for some reason the scholarship covers all tuition costs, you can get a refund on your plan and use that for housing, supplies, etc. or transfer the plan to another family member. Remember, you will never lose your investment! Is there a deadline for my child to use their Florida Prepaid Plan? Depending on which plan that you purchase, you generally have up to 10 years after the projected year of college enrollment listed in your prepaid application. I appreciate that Florida Prepaid has taken this into consideration! Sometimes kids like to take a year off to decide which career that they want to pursue or perhaps they would like to travel abroad. This is fantastic news for us as parents! Today is the day to change your child’s life forever! Give Your Children the Lasting Legacy of Education with Florida Prepaid College Plans! Lock in your low rate while saving towards your child’s education– You won’t regret it! Remember to use Florida Prepaid College Plans promo code SWEET19 to save $30 off your application fee. Be sure to follow Florida Prepaid College Plans on Facebook, Twitter, Instagram and YouTube to stay up to date with information on open enrollment, tips and promotional offers. Do you Still Have Questions About Florida Prepaid College Plans? Be sure to check out my posts HERE and HERE that may help to answer any other questions that you have. With Florida College Prepaid Plans, Starting is Believing! This entry was posted in Family, Kids, Lifestyle and tagged Florida Prepaid, Florida Prepaid College Plans on April 18, 2019 by Heather Brickell. Through September 30th or while supplies last, Nestle is offering a coupon valid for a FREE 8-pack of Nestle Brand Sparkling Water! Please note that you’ll need to use the offer specific to your state. This entry was posted in coupons, Deals, Freebies and tagged deals, Freebies on April 17, 2019 by Heather Brickell. Easter is quickly approaching and these Rice Krispies Bird’s Nest Treats are always a hit at my house. The boys love to help me make them and they are very yummy! You can change out the candies inside if you prefer something else over M&M’s. Melt the butter in the microwave for about 1 minute. Add in the marshmallows and stir with the butter. Place back in the microwave for about 1 minute and 45 seconds. Stir together until completely melted together and smooth. Place the Rice Krispies in the mixture and stir completely. Have a 12-count Muffin pan already sprayed with Cooking Spray ready to go. Take a generous amount of the mixture and place in each Cupcake slot. While the slots are still soft, take a spoon and create a small hole in the middle of each one to form a nest or basket. Let the nests harden for about 10-15 minutes. You can also go back at this time to adjust your nests and take out more of the mixture if needed. Add in the speckled M&M’s to your nests. You could really use whatever candies that you like in the middle of the nests but I love these speckled M&M’s for Easter! 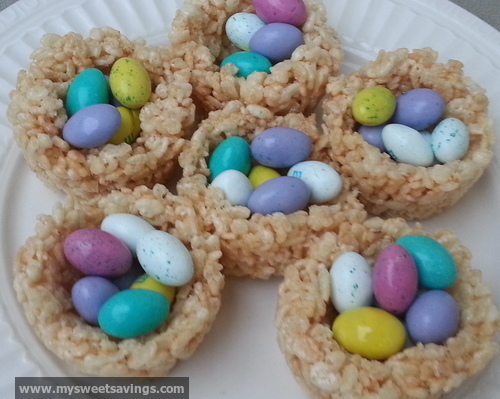 This entry was posted in Dessert, Kids, Recipes and tagged Easter, Rice Krispies Bird's Nest Treats on April 13, 2019 by Heather Brickell. LEGOLAND® Florida and Florida Prepaid have partnered together to encourage Florida families to support their children’s imagination all while saving for their college education! This post is sponsored by Florida Prepaid College Plans. All thoughts and opinions are my own. Please see my disclosure policy. How do I get my discounted LEGOLAND® Florida tickets? When do I need to purchase my LEGOLAND® Florida discounted tickets by and when will I receive them? If you enroll in a Florida Prepaid plan, you can expect an email with more information on how to access your LEGOLAND® Florida discounted tickets after Open Enrollment ends. Your tickets must be purchased by October 27, 2019. With Florida Prepaid College Plans, Starting is Believing! With a Florida Prepaid College Plan, saving for college is simple and stress-free. While your kids are focused on their LEGO® creations, you can make sure they are prepared to attend college and pursue their goals. Now is the time to prepare for their future education! You can learn more about Florida Prepaid College Plans HERE. Don’t forget to use Florida Prepaid College Plans promo code SWEET19 to save $30 on your enrollment fee! Be sure to check out my posts HERE and HERE that will give you more details and information on Florida Prepaid College Plans. This entry was posted in Family, Kids, Lifestyle, Travel and tagged College, Florida, Florida Prepaid, Florida Prepaid College Plans, legoland on April 10, 2019 by Heather Brickell.